A Digital Agency Built For Now. Three to five years ago, Twitter was a dominant force in the social media marketing world. Marketers flooded to the quick-paced platform to get their content out in front of millions of people. Fast forward to today and Twitter is still very popular, but the network is not as dominant as it used to be. One of the reasons Twitter has seen a slight decline is due to the most engaging social media app currently available, Instagram. The Twitter vs. Instagram debate has been very interesting to say the least. We’ve seen some marketers and big brands start to shift away from heavily focusing on Twitter and put more effort toward Instagram. Right now, Instagram is where consumers live. But does that mean you should jump ship and forget about Twitter too? Not necessarily. We’ll break down some of the similarities and differences between the two social networks and help you get a clearer picture of which one is best for your brand. As you’ve seen with our Facebook vs. Twitter and Instagram vs. Facebook articles, statistics can give you a lot of insight into which social networks you should focus on based on popularity. You shouldn’t make your decision solely on these numbers, but they’ll give you a great place to start. 77% of users outside the U.S. Even though Twitter has been around longer, Instagram surpassed Twitter’s number of monthly active users. This stat alone is what has made more businesses take notice of the app and start to learn the art of Instagram marketing. Twitter still wins in the content sharing department with more than 500 million Tweets sent out per day compared to 80 million photos posted per day on Instagram. A big piece of the Twitter vs. Instagram debate stems from the fact that they both have identical audiences. When you look at their demographics, you’ll notice that the two social networks have similar users in age, income, education level and even location. The main age group of users for both networks is 18-29 year olds. After 50+ years old, the number of users start to drop significantly. The other stats show Twitter and Instagram are particularly popular among people in their 20s who are either in college or have recently graduated. This is generally the user base that tends to drive social media growth in general because this group is the most active. If you’re after a younger demographic, you can’t really go wrong with either of these platforms. The even divide in gender and location gives marketers significantly more reach than sites like Pinterest or Google+ which have audiences that are either predominantly female and male, respectively. Since the overall demographics for both social networks are pretty evenly matched, you’ll want to look at the audience of your particular profile to get an idea of who is following you. The additional information you have about your followers, the more targeted you can make your content. Your social media posts should be tailored to your followers as much as possible in order to get the best results. Instagram has the most engaged users of any social network. Instagram focuses on keeping users glued to the app while they’re browsing with little to no distractions. There are no clickable links in the captions or ads to external sites when scrolling through a feed. By excluding unnecessary features, Instagram is able to keep consumers focused on the content that’s being posted, which is a huge advantage for your company. On the flip side, we have Twitter. This social network is very noisy. Your feed is filled with links to blog posts, news articles, videos and other content that takes you away from Twitter’s app/site. That makes it much more difficult to get your followers to see your content and engage with it. And because Twitter moves so quickly, the lifespan of your Tweets can drastically vary depending on how many other users your followers are following. For instance, if your average follower is following 1,000 people, your content is going to be one in a sea of thousands of others. And as other people start Tweeting, your content will be pushed down further, which can make it go completely unseen in some cases. Here’s an example of how much more engagement Instagram posts get than Tweets. The latest McDonald’s campaign is #AllDayBreakfast, where the fast food chain will now offer the breakfast menu all day long. The company took to Twitter and Instagram to promote the change. The amount of engagement from the few Instagram posts compared to dozens of Tweets is a clear sign that Instagram users are more engaged. 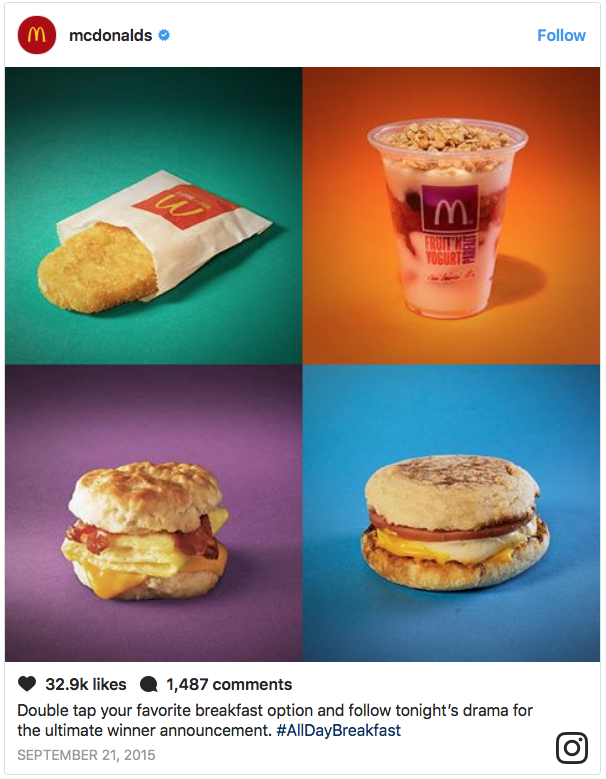 Those two Instagram posts alone received more engagement than all of McDonald’s tweets combined about the All Day Breakfast promotion. While Instagram might have more engagement on the specific platform, Twitter actually builds engagement outside of social network. This is why marketers should think twice about taking their focus away from Twitter. Readers can’t easily share a blog post to Instagram. When you read our blog posts here on Insights or on other blogs, you’ll notice social sharing buttons within the post. These buttons make it easy and convenient for readers to quickly share content across Twitter and other social media sites. That helps promote your content to new people who may not have been aware of you before. Instagram doesn’t have this feature, which is a drawback specifically for content marketing. Social media engagement for Instagram basically begins and ends in the app. But with Twitter, you can drive engagement outside of the social network by getting people to Tweet links to content on your website and other platforms. That is a good segue into the next point, which is functionality. Instagram keeps you within the app on purpose. The company highlights the content users share. The value comes from within the app. Twitter is essentially a content distribution tool. There isn’t very much original content on Twitter, and the network primarily consists of people sharing links or live updates. It’s about following what’s going on in real time. The value of Twitter comes from the content you discover on other sites. Imagine if people couldn’t Tweet links. It wouldn’t be nearly as successful as it is today. This doesn’t mean that either approach is better than the other, they’re just different. Depending on your brand’s goals, one might be more favorable than the other. For instance, if your company has an active blog and you have a consistent supply of fresh content that you need to promote, Twitter is a must-have. It’s one of the easiest ways to share your content on social media. However, let’s say you don’t have a company blog or your website is fairly static. It might make more sense to take advantage of Instagram. You can share quality content on Instagram and keep a link to your website in your bio to what you’re trying to promote at the moment. For instance, Uber used Instagram for a new project called Why I Ride. The campaign features images of beautiful landscapes from different cities. Since the focus is on the images and stories, Uber was able to just include a link to the #WhyIRide campaign in the page bio and focus strictly on content within the Instagram posts. We also can’t overlook one of the other key functionalities of Twitter for businesses–customer interaction. Twitter is about conversations, which is why so many brands use it as a customer service tool. Consumers have also gotten into the habit of using Twitter for customer support and feedback. People aren’t afraid to voice their opinions of companies on Twitter, good or bad. Instagram doesn’t have that same functionality. Despite its rapid growth, a lot of companies don’t actively monitor their Instagram accounts like they do Twitter. In fact, having dedicated Twitter accounts strictly for support has become the norm for businesses. If your company sells physical goods or serves the masses (as opposed to a solo consultant for example) then Twitter is going to be important. Twitter gives companies a better way to interact directly with customers than Instagram. That’s also a big reason why Twitter continues to be one of the top social media channels. You can quickly communicate in real time. Instagram is more focused on the content than customer-to-business interaction. The conversations typically revolve around the Instagram posts instead of customer issues and questions. Understanding the difference between how people use Instagram versus how they use Twitter is extremely important when it comes to deciding which is best for your brand. The last thing to keep in mind is advertising. As of right now, Twitter’s advertising platform is open. Meaning you can sign up today and start running ads. Instagram on the other hand is still in the early stages. One technique that a lot of new businesses are using to help get established on Instagram is purchasing shout-outs from established accounts. This is the closest thing most companies will get to paid advertising on Instagram for the time being. Is Instagram the “Twitter killer” that some people claim? Not really. Even though they serve a similar demographic and audience, they have two completely different functions in your marketing strategy. Instagram is a place to publish original content and build your brand. Twitter is a great tool to curate and distribute content, as well as engage and interact with your audience. You don’t have to choose one over the other. Look for ways to integrate both into your social media strategy and you’ll get much greater results. Powered by Persistence, Analytics, Combined with Math and Creativity.